When I first decided to bring a new Sheltie puppy in to my family, I unfortunately had some reason for concern. Jari, one of my Finnish Spitz, had exhibited some dog reactivity throughout his lifetime, and it was not limited to just adults. I had to manage him a lot while out in busy places like popular parks and at dog shows, and even during our normal daily walks, some days were a struggle. That all being said, I thought very hard about how I would handle things if Jari did not get along with the potential new addition. Ultimately, I decided that even if we needed to do a crate/gate and rotate thing at home, it would be worth it to have this very special little pup. Initial greetings went better than I thought. My dogs all met the new puppy, who was 5 months old at the time, off leash in a large fenced in area. Kimma went in first, then Bubbles, and Jari was last. Jari had plenty of room to sniff around so he really didn't interact with the puppy at all. And by that time, she was busy following my girls around anyway! So far so good, as I'd much rather have him ignore her than have an issue. As I put her in the car for the ride home, Jari did growl. He growled again and barked at her as we got out at a stop - I had the back hatch open, and he was therefore able to see her through his crate door. I knew that I definitely might be in trouble. And I'm not going to lie, the initial greeting had gotten my hopes up a bit. Upon arriving home, I took one of my older girls and the Sheltie puppy, who I named Sonya, in the yard first to do their business. Then I brought Sonya in and put her in her crate in another room while getting Jari and my other girl. So the first potty break back at home was totally normal for him. He, of course, could tell that a "different" dog had been in the yard, and I gave him all the time he wanted to sniff around. This is the whole gang in my living room one month after Sonya came home. For the next few days, all Sonya and Jari did was gate and rotate from a couple of rooms away. My Finkie girls Kimma and Bubbles would go with either one depending on what was going on - both of them accepted Sonya in to our house no problem. I should mention that I am lucky to have two doors out to my yard, so I could easily take Jari and Sonya out separately with no way of them meeting. Sonya's crate was near one of the doors in my laundry room, and Jari's is closer to the other outside door where my other dogs' crates are (again, his routine was hardly disturbed). For meals after the first few days, I gave them each a slow feeder bowl in front of gates two rooms away. They could see each other, but there were two baby gates and an empty room (or the other two girls) in between them. Once they seemed comfortable, I would do something similar with good chews like bully sticks - I would have Sonya in the kitchen, baby gate, Bubbles and Kimma in the middle room (Bubbles in a crate, Kimma free), baby gate, Jari in the far living room. Really good stuff to chew, but still lots of distance. Next, I would alternate between slow feeders with just one baby gate in between but a lot of space, and training one dog for their meal while the other was in the next room with a food puzzle toy. Over the course of approximately two weeks, I moved the slow feeders closer to the baby gates, and I did the same with good chews. Training then became one dog relaxing on one side of the gate with my tossing them treats, while the other was being actively worked. In terms of potty breaks, we still kept those separate for about three weeks. Luckily I was able to get some help in walking them on occasion, and we began walks far apart (Jari was SUPER interested in Sonya at first), then slowly bringing them closer. Jari was more interested in smelling things than bothering with Sonya, and she would soon even join in on sniffing with him! Great progress! It didn't take long before I was able to walk them together. And after a couple of weeks there was also no issue with having them both in their crates in the car at the same time. About three weeks after bringing Sonya home, I decided to try having them in the yard together. Since Sonya would usually run out in to the yard VERY excitedly, I figured that it would be better to have her go out first with the other two girls, then let Jari out. My husband was home with me to help supervise, I had a pocket full of cheese, and each dog was to be let out on leash. Even though I have done this type of thing dozens of times with clients, I was still nervous. But I felt that it was time. I knew that each dog had a VERY strong recall in the yard, and if that failed, my husband or I could always grab a leash. 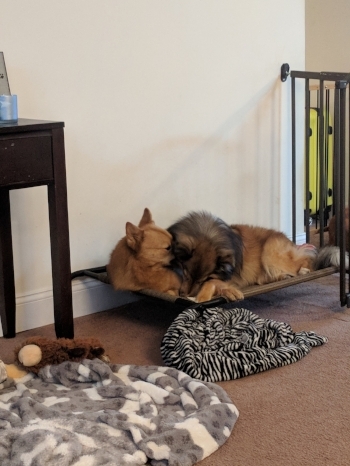 Ultimately, I had backup plans in place, and at the very least, the two of them were pretty comfortable being on either side of a baby gate. Separate potty breaks for life would not be a huge deal at all. This was not the end of the world. I could always try again at another time. I let Sonya, Kimma, and Bubbles out through the laundry room door. My husband went out with them. I took a deep breath, relaxed, and went out with Jari. To my amazement, after a very interested Jari ran over to sniff Sonya, he was met by a play bow. He reciprocated, and the two of them played a quick game of chase like they were old friends. I was relieved. I kept things short and sweet during that first time out in the yard, but I gradually increased such times out over a few days. It was at that time I wanted to try them inside together. After a bit of play out in the yard, I brought them in through the same side door just like I was hoping would become the norm for them eventually. This went very well - no issues! Again, I kept their loose time together inside short for a few more days, and before I knew it, they were out loose together constantly. Jari and Sonya from a few weeks ago - a little over a year after she came home. They lay together like this often now. As it stands now, I think Sonya was the best thing to happen to Jari. His reactivity when out on walks with her has decreased (she is not reactive at all), and the two of them have even accompanied me on long trips to other states to judge nose work trials with no issues! They were loose with me in hotel rooms, walking together at the show site and at rest stops to and from home, and I think they had a blast. They play together almost daily, which is something neither Kimma or Bubbles would do with Jari very regularly. Not only am I fortunate to have Sonya in my life for all she's given me, but now for all she's given Jari. They truly do enjoy each other's company, and I am so glad I took things slow with them.